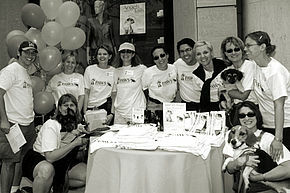 In 1998, Paula had a vision to host an adoption event to bring homeless pets to high-traffic places and talk about what was happening to these animals in Chicago. When she ran into an acquaintance who was a high-level executive at Ogilvy & Mather, she was able to garner their creative support. Angels with Tails was born. On May 30, 1998, the homeless pet message was taken to the public—on the streets and in the boutiques of the Magnificent Mile where local businesses enthusiastically agreed to showcase the animals in their storefronts. The response was better than could be imagined. Hundreds of residents, workers and shoppers came out to show their support. Most media outlets covered the event. Materials spreading awareness about the killing of homeless pets were distributed to passersby. Best of all, almost every animal went home with a new family. But the impact that day was just the beginning. The next day, Paula had dozens of voicemails from people asking how they could help continue the important work started at Angels with Tails. Today, Angels with Tails adoption events continue to work their magic, raising awareness and promoting adoption in communities across Chicagoland. Read more about the launch of Angels with Tails. 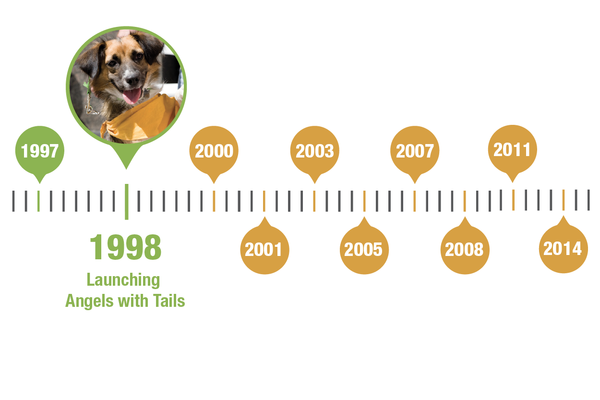 Following the success of Angels with Tails, many people wanted to know what was next. Paula and her husband, Peter, strategized. They were remodeling one of their community bank branch locations in Lincoln Park and planned to sublet a small space. Instead, they decided to donate the space to be a storefront adoption center. The Clark Street Storefront Adoption Center was born. Paula and Alexis forged a partnership with Animal Care & Control, which allowed them to bring cats and dogs from the city pound to the storefront on weekends. A group of dedicated cat rescuers used the space to showcase homeless cats throughout the week. With the bustling Lincoln Park location, volunteers and adopters would wander in to meet the animals in the window. Read volunteer Jennifer Beck’s reflection on volunteering in those first days here. In July, a second Angels with Tails adoption event was hosted on Armitage Avenue in Lincoln Park, bringing more people to the cause and saving more lives. This led to additional adoption events on weekends in city and suburban malls and shopping districts to continue to raise awareness. Paula knew that small-scale adoptions would not create transformative change that addressed the pet overpopulation crisis at its source. A friend in San Francisco sent her an article about the progressive work being done to build the first No Kill city. Paula and Peter visited San Francisco to learn more about the strategy in San Francisco. They met with Richard Avanzino, then the executive director of the San Francisco SPCA. “Everything Richard said made sense,” Paula recalls. From focusing on bringing adoptions to the public, to providing spay/neuter, to refusing to have killing contaminate the culture of a private shelter, San Francisco was on track to building the first No Kill city. Paula recognized that in order to significantly reduce animal overpopulation in Chicago, it was necessary to reduce the number of animals being born.